Peter Goodhall (2E0SQL) runs an the T2LONDON APRS-IS server (aprsc 1.7.6) for London. The status of this server can be found here: http://london.aprs2.net:14501/. I will use this server, because it’s local to me and run by a friend, but feel free to substitute your preferred server here. Fire up UI-View. This article assumes you have a working APRS setup. If you don’t then read the UI-View APRS manuals. My advice is that you use XASTIR instead of UI-View. UI-View hasn’t been updated since Roger Barker, G4IDE, passed away in 2004. Since then, a lot of the APRS paradigms have changed. …and you’ll be presented with a screen like below. My first recommendation is to remove all the existing default APRS servers. If you click on the first server listed, then press delete (not backspace, delete), you will be asked to confirm the removal. Repeat until the list is empty. then type the URL of the server in, in the format: address:port. Here, I use london.aprs2.net:14580 as mentioned above. You can repeat this as many times as you need to add all of your servers. Maybe england.aprs2.net:14580, euro.aprs2.net:14580 or rotate.aprs2.net:14580. Others exist. These are all second tier servers, others do exist. Google is your friend. Make sure the box is ticked to the left of the address. This enables the use of this server. If you need a Verification number, visit the APRS Callpass page and enter your callsign. Next, connect to the APRS server again. Click Action > Connect to APRS Servers. You can log into the server you’re connected to and see your connection. Any errors will be shown there. Here you see MB7UCL connected to london.aprs2.net:14580 APRS-IS server. The connection is verified. Should do the trick. 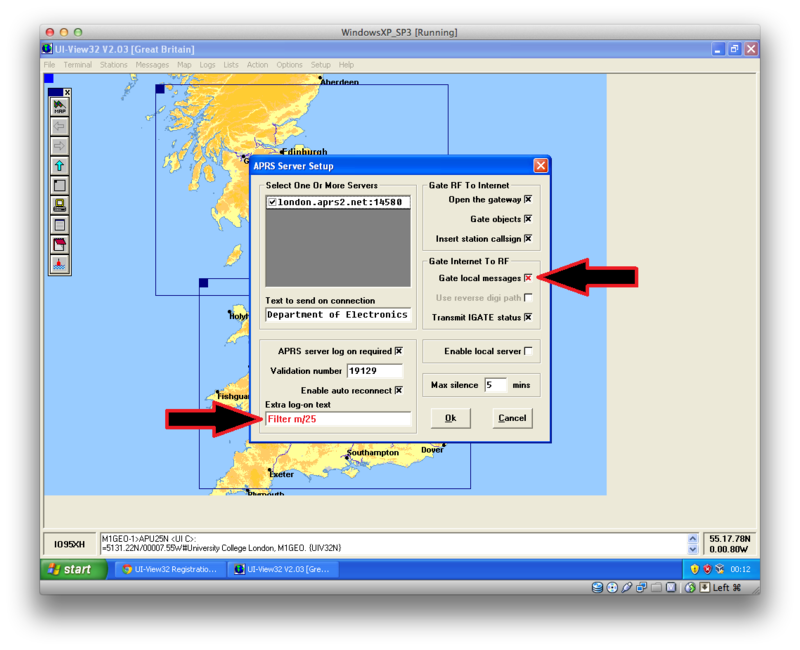 The above filter repeats stations within 25 km of your callsign’s location. I have known people to have this value as high as 600 km, which is plain ridiculous! The “Gate local messages” field can also be useful to repeat messages to stations in your vicinity. This means that someone at a great distance can push messages into the APRS-IS network and have them re-arrive at the destination node’s local IGate for transmission on RF.